Top Spin 4 is a virtual tennis experience for Tennis lovers and for those who would like to play tennis off the pitch, in the comfort of their homes. This video game is designed for the ultimate on-screen tennis for experts and fans of the game as well. This is the fourth edition of the Top Spin franchise and it is the most feature-rich version made in the series. This game, created for the PS3, Wii and Xbox 360 consoles, will surely get your attention with all its awesomely detailed aspects waiting for us to explore them. The new coaching and development systems in the game and the intensive character creation set the edition apart. The TV broadcast and outstanding career modes will help the player in rising in the competition and run towards being number one in the world. The game is so realistic and each character is forged in a different style, the individuality of every other player stands out with this effect. From player positioning to selecting the position in the court and the type of shot to be taken influences every point the player receives and if you are interested in playing with other players from around the world, the game offers the option to switch to world tour mode from offline career mode. The offline career mode progresses with a fictional leaderboard that has the names of computer generated famous tennis players like world champions Roger Federer and Rafael Nadal. The world tour mode offers an opening to challenging real players from all players around the globe and it will be ultimately more fulfilling to get your character progressing on an international level and progress on world rankings. Top Spin 4 is a great game no matter which mode you choose to play and feel comfortable with. From the advertising board in the courts to each member in the crowd, everything about this game is rendered beautifully and is detailed so well that it will never cease to entertain the player. Top Spin 4 looks so life like and succeeds in giving the realistic effect and feels the virtual game aims in providing the player. There is no doubt in the authenticity of the simulation of the game, owing to the great visuals, in-depth mode of training as well as the online and offline gaming careers. The gamer will experience the emotional state of a professional tennis player on his or her path to the ultimate prize, to become the World champ. The improvisation in the tutorials provided in the training teaches the player all the different styles and strategies of the game and they are as much fun to watch as they are to play. 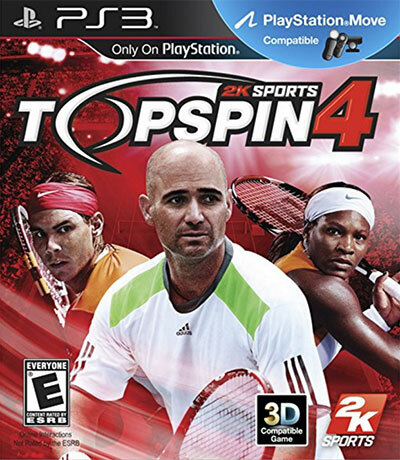 Top Spin 4 sets the standard by which games can be judged today and how well gaming companies can replicate the real deal at home for the gamer without picking up the actual racquet. Buy Top Spin 4 and enjoy playing tennis at home with one of the best of virtual coaches available!